I've collected at least one of each previous character from this awesome Bandai Star Wars Movie Realization series. 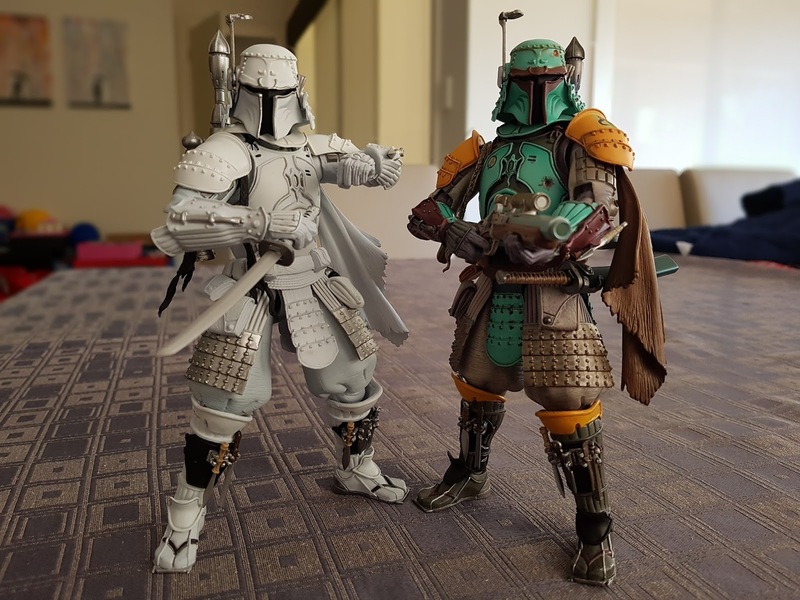 When they announced that they were going to release a Prototype Boba Fett version at SDCC this year, I figured I could do without another repaint. I thought the repaint would be a pretty bland white job, but man the variations in the paint are awesome! 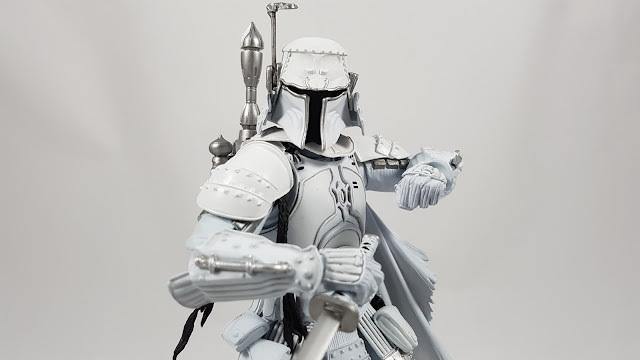 The sculpt of course is essentially the same as the previous Boba Fett, but the use of shades of white, silver, grey, and black actually really pop. The accessories to go on his shins were more difficult to put on this time, so definitely put the legs into some hot water to soften up the plastic before putting the little knives and gadgets on. All the other aspects of the figure, from the sword, blaster, shoulder pads, and cape are as per the previous version, obviously with a different paint app. 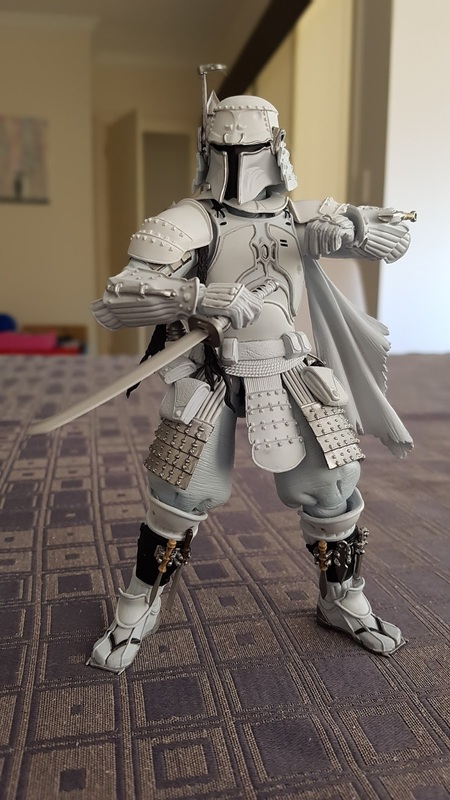 Everything is cleanly done and to a high quality by Bandai here. The paint app on the original Boba Fett had a green that was bordering on aqua. I would have preferred a darker shade of green, but they were probably going for the lighter Empire Strikes Back look rather than Return of the Jedi. Either way, the paint app on both are nice, and the stark difference between them on display looks great too. In the end, this thing looks so great I'm not regretting the higher price at all. It will be interesting to see how the upcoming Jango Fett repaint compares to these two. I'm definitely looking forward to the new Darth Maul figure too, which will be the first unique figure for quite some time in this series. 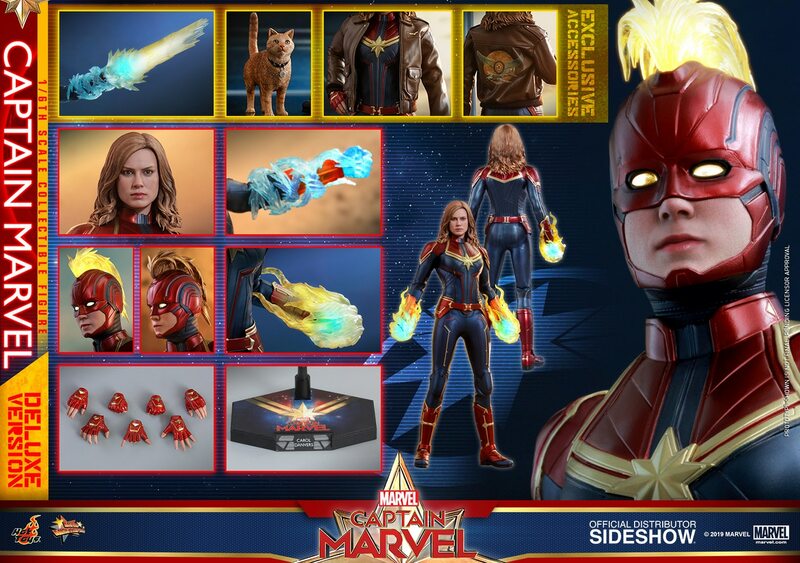 Hopefully they continue to make more of the characters from the concept art shown before.